On a March day earlier this year, neuropathist Jack Minard walked into Courtenay City Hall with four dead trout in a plastic baggie. He made his way to the engineering department and plunked the baggie down on the counter. “What can you do about this?” he asked. Minard’s eyes sparkle as he tells me this story, months later, around a big table in the 5th Street office of the Comox Valley Land Trust (CVLT). Minard is the CVLT Executive Director, and it was in this capacity that he was so dramatically alerting city officials to the problem of dying fish in Finlay Creek. He hastens to explain that this wasn’t an act of hostility. “I have a really good relationship with the engineering department and I didn’t have to do anything as dramatic as that… but, well, I just had to,” he says with a laugh. The story is, of course, a fun one, but it also says something about how a land trust works. A land trust is a non-profit organization committed to the long-term protection of natural and/or cultural heritage. A land trust may own land itself, or it may enter into conservation covenants (see sidebar) with property owners to protect or restore natural or heritage features on the owner’s land. Land trusts also engage in stewardship, restoration and management of lands, as well as public education, political advocacy, and community organizing to promote their environmental values. A land trust covers almost all the bases of what we imagine when we say, “environmental activism”—from scientific study to get-your-hands-dirty work on the land to meetings with politicians; from counting fish to changing policies. Pretty much all of those activities were represented by Minard’s bag of dead fish. The fish came from Finlay Creek in Sandwick Forest. CVLT has been working with the Sandwick Waterworks Improvement District to ensure that this 31-acre forest, which includes cedar trees more than 150 years old, will become park protected by a conservation covenant. Finlay Creek runs through Sandwick Forest and is a critical element for healthy fish production in the Tsolum River. CVLT has a group of volunteers that monitor Sandwick Forest, as well as a group for every other property they are involved with. They pick up garbage, report vandalism, and keep an eye on natural features of the property. When a CVLT monitor found dead fish in the creek, CVLT knew something was amiss. When they went to investigate, they counted 30 dead trout. Something was very amiss. The problem, says Minard, is that a portion of Finlay Creek has been built over. “It actually goes from Home Depot under the Aquatic Centre and keeps going under the subdivision to Sandwick Park; it’s all been put underground with a system of pipes and drains. So if anywhere in the system someone puts something down the drain, we get dead fish. “What we need to do is educate people,” says Minard. But a good education program needs a concerted effort with strong leadership and financing. That’s why he went to the City of Courtenay with a bag of dead fish—to get the municipality involved. “We’d like to see the city not just sharing costs but also taking the lead,” says Minard. Thus far he’s not entirely satisfied with the City’s response, but he’s not giving up. He did get noticed, and this has initiated discussions about some kind of partnership. “We did talk about the City helping to pay for a neighborhood campaign educating people about pouring things down the drains. Something is going to happen, although not with the level of municipal leadership we’d hoped for,” says Minard. CVLT was founded in 1999 by Shirley Ward and Diana Caldwell, two neighbours who were both concerned citizens. In particular, they were concerned about wetlands being drained, about massive use of pesticides, and about ecosystems dying out. They began to research the possibilities for creating a local organization that could garner a broad base of support, gather together diverse interests, and make a lasting difference to the environmental health of the Valley. The result was CVLT. The CVLT website sets out compelling evidence of the need it intends to address: only 13 per cent (approximately 23,500 hectares) of Comox Valley land is protected; and more than 90 per cent of that land is within Strathcona Provincial Park. Unless steps are taken to address this, the Valley will see a continuing loss of biodiversity, which will eventually undermine nature’s ability to provide essential environmental services. Clean air and water, healthy soils, local food production and natural resource industries are at stake. The popularity of the Comox Valley makes matters worse. The Valley is one of the fastest growing areas in British Columbia. The population is projected to reach 78,373 by the year 2020, representing a population increase of 19% (BC Stats information as of May, 2007). CVLT clearly has its work cut out. But it is not alone. The Comox Valley Land Trust is one of 32 locally-based land trusts in BC. Also, there are two province-wide land trusts, as well as one Canadian land trust. The oldest land trust active in BC is an international one, Ducks Unlimited. Land trusts often work together on conservation, stewardship projects, and campaigns, and it is common for two land trusts to act as co-holders of a covenant, providing an extra level of assurance and sharing the responsibilities involved. Beyond all the work involved in seeking out, setting up, and overseeing covenants, CVLT has been very active in setting up partnerships in the community. “Our strategy is to expand to be a real voice for conservation in the Comox Valley,” says Minard. One of CVLT’s most exciting projects is the Comox Valley Conservation Strategy. The goal is ambitious: to ensure that all land-use in the Valley serves conservation values. CVLT has set up a Conservation Strategy Steering Committee, which is working with regional and municipal planners, engineers, politicians and community groups to develop a new way of doing business. A big part of the conservation strategy work involves creating clear information about conservation issues, such as maps of sensitive ecosystems, identification of areas identified by the community as high-priority for conservation, maps of protected lands (parks, greenways, wildlife and ecological reserves, and covenants), and wildlife information. Minard says local authorities and residents have been receptive to this initiative. As CVLT makes more partnerships and gets involved in more projects, it becomes more influential. This is proof, says Minard, of the power of working in a group. While individuals can, and have been, very powerful in the environmentalist movement, he feels that the coordination that groups provide is invaluable. “In the past, the most passionate people would go to city hall. Definitely, a clear, articulate person can do a lot, and here in the Valley we’ve had very effective people like Melda Buchanan. But even more effective is collaboration and partnerships. You can speak for large swathes of land. Minard says that even those who seem to be “the enemy” of environmentalism can turn into partners. He cautions against a confrontational approach, instead advocating dialogue. Ultimately, he says, we will be more powerful if we can find common ground—and this isn’t as hard as it may seem. CVLT’s love of partnership was very evident in their recent fundraising event, Celebrating the Lorax, held at the Comox First Nations Band Hall and Big House this past April Fool’s Day. “This was our answer to galas. These events are usually raising money for one specific organization; they are dressy, kind of staid events which seem to be losing their popularity,” explains Minard. CVLT decided to do something very different—something livelier that would reach out beyond the established base of supporters. “Board member Vivian Dean had encountered the Dr. Seuss book, The Lorax, and in all her creativity thought that we could get kids involved,” says Minard. CVLT decided to create an award called Celebrate The Lorax –Caring for the Trees Award to honor youth environmentalists. The Lorax is a classic Seussian story of a creature who speaks up to prevent a forest being destroyed for a development. Organizers added another youth element, as well as a multi-cultural emphasis, by inviting the Kumugwe Dancers, a youth troupe from the Comox Band, to come on board as performers. Scouts Canada also joined in to take part in an innovative fundraising activity described as an “interactive pledge tree building,” in which, over a the period of just a few minutes, the Scouts ran around getting people to sign pledge forms which they used to decorate a big tree. The event included a silent auction, a speech by Iona Campanola, and the presentation of the award to 18-year-old Emily Sunter, a very active member of the Interact Club, a student environmental group at Highland High School. So far $8000 has been raised, and they are still waiting to complete the raffle of a donated Brian Scott painting. Some of the funds were used to buy a new bear mask for the dancers, some donated to the Scouts, and the rest will help keep CVLT going for the next year. As well, important partnerships were developed, people had fun, and young environmentalists gained encouragement. CVLT has more plans for fundraising that include a sense of fun and community building. This July 17, at the Downtown Courtenay Market Day, CVLT will be hosting a Toonie Walk. This is a resurrection of an event held back in 1956, when a woman’s group held a penny walk to raise funds. However, back then there were no toonies. Whether thinking up fun ways to raise funds, walking through City Hall with a bag of fish, talking to the media, or strategizing at a board meeting, Minard stays motivated by his deep conviction that environmental engagement can (and has been) effective. A long-term activist—he spent 18 years involved with the influential group SPEC (Society Promoting Environmental Conservation) and currently is Executive Director for the Tsolum River Restoration Society as well as working for CVLT—Minard has never become jaded, and has no plans to. “I sometimes see around me a kind of cynicism that has resolved itself, become hard to shake. That’s the biggest enemy to democracy,” he says. Getting involved—with a group, or on your own—always pays off, he says. Not wanting to miss a chance for a direct appeal, he points out that CVLT is always looking for volunteers, members, and donors. “I would suggest that CVLT is one of the best regional, broadly-based conservation-centred groups to join,” he says. 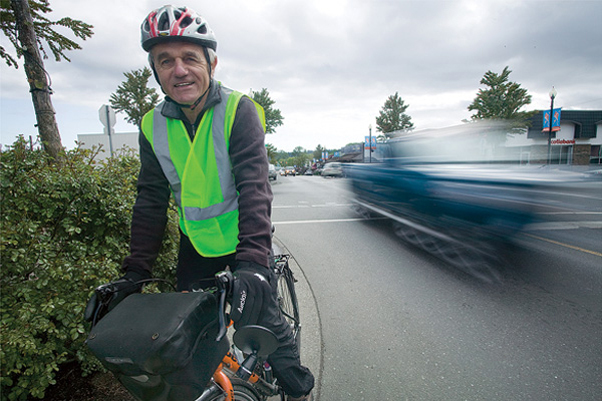 If you could look into the future, what would be the outlook for cycling in the Comox Valley? The Comox Valley Cycling Coalition has a clear vision. In fact, a 20/20 vision—by the year 2020 to see 20 per cent of the transportation budget spent on cycling infrastructure, with the goal to get cycling up to 20 per cent of all the modes of transportation. On a perfect day for cycling, sunny and warm, Ed Schum, founder of the newly-formed Coalition, leads members along a recreation and reconnaissance ride. The Coalition has 173 members from all walks of life, many who give time, talents and expertise to help make conditions for cycling in the Comox Valley safer and more convenient. Schum is a grandfather himself, and has been cycling for most of his life, racing and coaching. After retiring as owner of the former Mountain Meadows Sports in Downtown Courtenay, he began touring by bicycle and blogging about it at www.crazyguyonabike.com. “Now that I am over 65, I thought it was time to slow down,” he says as an introduction. “Get into some touring and see more of the beautiful Canada I live in.” His online journals include Grandpa Cycles across Canada, 2007 and Grandpa Cycles Europe, 2008. Pink plum-tree flower petals scatter over the roads as the group leaves Downtown Courtenay over the Condensory Bridge. Along the way, Schum provides helpful tips about cycling safety. The mission of the Comox Valley Cycling Coalition is to create a safe environment for cycling in the region, and encourage cycling as an effective, economical, healthy and environmentally friendly mode of transportation. The group rides in single file and turns onto Cessford, a quieter road. The paving surface changes noticeably—the coarse surface Schum calls chip seal is an inexpensive re-paving method used by the Ministry of Transportation, but is quite dangerous to cyclists. “Part of Headquarters Road and Coleman Road—very popular cycling routes—were freshly done in this surface last year,” Schum says. “If anybody ever went down on that, they would be very badly injured.” It is ironic that over a century ago roads were originally paved to accommodate bicyclists, but now the needs of cars dominate. The Coalition has reached an agreement with the Ministry that all chip sealing will be put on hold, until an acceptable surface for cycling is decided upon. Luckily the rough section is short, and the smooth surface resumes— in time for an uphill incline along Piercy Road. The pace slows, and the temptation is to stop and smell the roses—or here, the scent of cedar from the nearby sawmill. Everyone gears down but soon the grade flattens and the group turns north onto the Inland Highway. The shoulder is wide and the rumble strip that separates the car traffic allows plenty of room for cyclists. “The rumble strips here are not bad,” Schum says. “The shoulder is still wide enough for cyclists.” His neon-yellow cycling vest is highly visible and traffic gives the group a wide berth. At the Dove Creek interchange there is a pause for a group photo by Brian. After the turn, the group continues to complete the ride, some exploring a longer route before heading back to town for a sociable coffee. We can’t wait for The Broken Spoke to open so we can come up for a visit from Victoria. Great photo guys – looking great!!! Congratulations, guys! this is so exciting for you – I hope you’ll have great success! Wow, Nice to see that things are working out! Best of luck with all guys! Misty Valley is NOT Direct Trade. Roasters shouldn’t lie about getting certain coffees via direct trade. You can get Ethiopia Misty Valley from many roasters. And the main importer is located in Holland FYI. Retailers should do their homework when talking about coffees and not believe everything their roaster has to say.